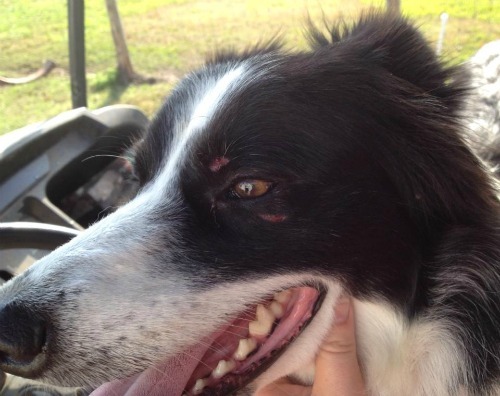 As those of you on the farm Facebook page already know, #1 Ranch Dog got nailed in the face by a cow this week. Ouch! The reason she got kicked was because she just had to have the last word. She was moving cattle into a catch pen and after getting all the heifers in the pen, one cranky broad decided she was coming back out. Lily immediately moved in, bit her in the nose to turn her around, bit her in the heel to head her back into the pen, and for good measure, bit her again in the heel. That's the bite that got her kicked in the eye. The cow went on into the pen, and Lily wiped her eye with her foot and then got back to work. I freaked. It was a simple accident, but then, most accidents happen just that fast, that's why we call them accidents. But it highlighted two issues. 1) Lily was doing the work because Trace couldn't do it. Troll is fine for gathering cattle at a distance, but for pen work, you might as well get Lily because he doesn't see a point in it. He also doesn't have the balls to go 'one on one' with a cow that challenges him. He bullies sheep and goats to the point where he has been banned from working small stock, but when it comes to big stock, if a cow calls his bluff, Troll Dog backs off. But Lily doesn't back off, and it's not a bluff. Challenge her authority and she will eat you, and enjoy doing it. 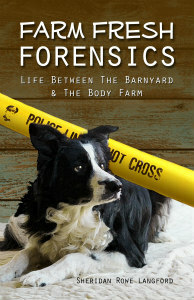 She may not have the fancy moves of a trial dog, but she reads livestock, and she has an unfailing work ethic. Those two traits can take you pretty far on a farm. 2) That brings us to the second point. In essence, we only have one good working cow dog. We have a house full of dogs, but only one 100% reliable cow dog. Cowboy is too old to work now, and Trace is only good for distance work. Lily is having to shoulder all the responsibility for cow work. It slowly dawned on me that although Lily is five years old, in her prime really, it's time to start a puppy to help shoulder the work responsibility later. The inventory results revealed what I already knew. We have too many dogs, but not enough working cow dogs. So I begin to mull over the idea of another cowdog. 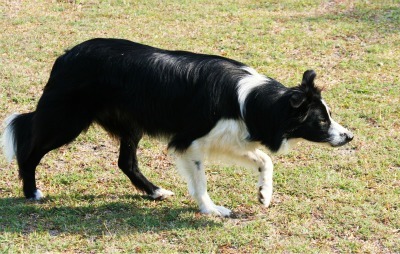 Finding Border Collies is easy. 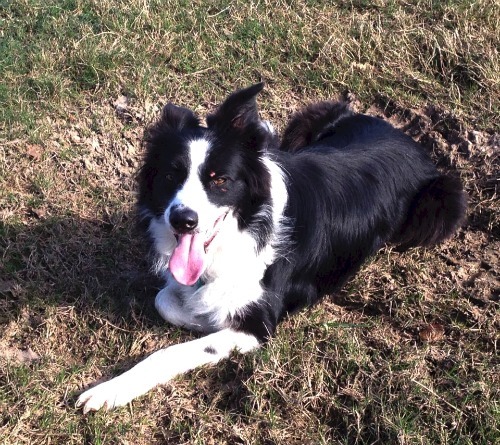 Rescues are full of homeless Border Collie. These are very nice dogs that need a family and will make the perfect pet. But I don't need another pet, I need a ranch dog - a very specific kind of ranch dog - the kind that can work cattle. That gene pool is much smaller - much, much smaller. 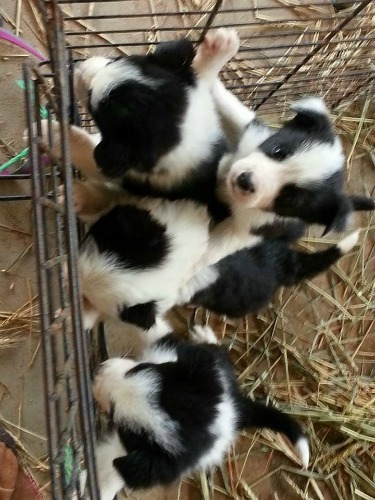 A good friend of mine just raised two litters of working dog pups. Nice pups. Really nice pups. I resisted. I wasn't ready for another dog. I wavered, but resisted. And then one day, Thanksgiving Day to be exact, I saw Lily's breeder on Facebook. I scanned his page with feigned casual interest. After all, I wasn't looking for another dog this soon. I sent him current pictures of Lily so he could see how well she turned out. This proved to be my un-doing, as he had another litter of puppies now. Oh crap! I wasn't ready for another puppy right now! 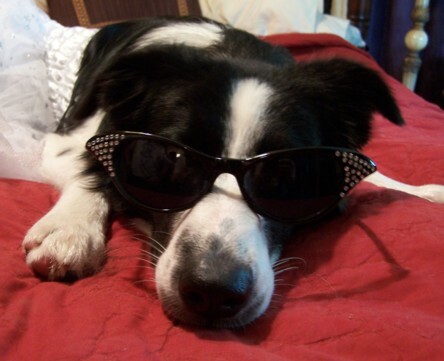 But it was related to Lily, my #1 Ranch Dog. She's sound, she's sane, she works. He sent pictures. I'm on my way up this weekend. I have promised myself that the pups must test as well as Lily did at that age or I'll just wait. 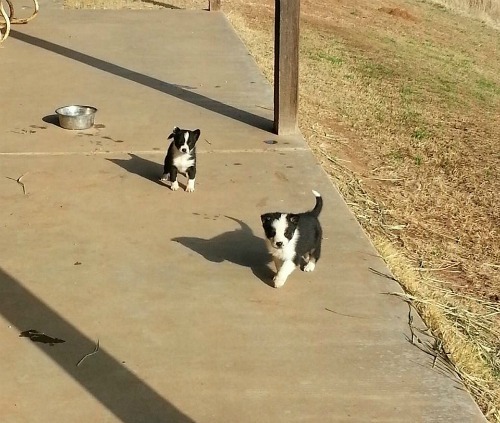 Another rancher that lives nearby has noticed how handy Lily is around the farm, and wants a puppy from that line too, so if all goes well I will be returning with two puppies. We shall see. Perhaps Lily will soon have an apprentice. Finding a good working BC is tough and one that works cattle even tougher. I just got a new Tervuren puppy that I plan to be my assistance dog if needed. He is very cute and a lot of fun. He may work sheep. My next working dog will be an older dog so I can see how they work stock. I don't have the space to have extra dogs and so to be sure what I have it will be older. I wish you good luck with a new puppy. They are really fun. They change every day. I had actually put serious thought into getting an adult who was already working cows, but considering the size of our pack and the pack dynamics, it was easier to get a puppy that would fit in easier and just place my bets that a pup from this line would be healthy and have work ethic. You know - it's only one more bowl - which, really doesn't take that much longer to fill. That is the logic I always use. Hopefully, Queen Lily will like Ranch Dog version 1.5 and teach him/her the ways of the world. What's the issue? I only counted seven dogs on your list. Sounds like you have room for one or two more. HaHaHa!! I have puppyitis really bad right now, so I'm a little jealous. Don't take this the wrong way, but it is not necessarily clear that Trace's limited toolbox is genetic. His training was heavy on gathering at a distance, when you were using him on that because "when I need him, I really need him" and he was not being similarly trained on Lily's type of work. You also felt that Lily's refusal to gather at a distance is due to how you trained her. I know lessons are difficult to get to, but you might consider emphasizing them more with the new pup, or leaving him or her where he or she could have lessons for awhile when old enough. It might be a better way to get a balanced dog.